Little, Brown Books for Young Readers, 9780316002578, 336pp. New York Times bestselling author of The Candymakers, Wendy Mass weaves an intricate and compelling story about strangers coming together and establishing unlikely friendships. Three middle schoolers are brought together at Moon Shadow, an isolated campground where thousands have gathered to catch a glimpse of a rare and extraordinary total eclipse of the sun. Ally's parents own Moon Shadow, where she's lived pretty much her entire life. When her parents tell her they're moving away to the city, she's suddenly frightened and desperately wants to stay at the only home she's ever known. Bree is popular and gorgeous, but with scientist parents and a brainiac little sister, she is the black sheep of the family. When her parents break it to her that they're moving to Moon Shadow, Bree realizes that popularity doesn't mean a thing when there's no one there to see it. Overweight and awkward, Jack is confused when his science teacher asks him to go on a trip to view the eclipse at Moon Shadow, especially since he failed science class. Although this is a chance for Jack to bypass summer school, it also gives him the courage to come out of his shell and find true friends for the first time. 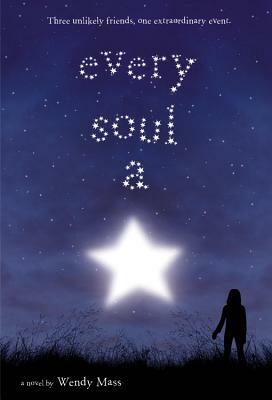 With breathtaking descriptions of nature and its ultimate phenomenon, the eclipse, Every Soul a Star is a powerful and humorous story about dealing with change and discovering one's place in the universe.